Thank you all for you kind comments. Although I am still coughing , sniffling and hearing strange noises coming from my chest as I breathe, I am actually much better than I was at the weekend. I can't say the same for my husband though, he is still very unwell and refuses to take any medication or go to the doctors. Maybe like me his symptoms will just ease away. I made these banana flapjacks during Fairtrade Fortnight, but had not got round to posting it. So here it is a little late. They are quite simple and straightforward to make. A good breakfast treat. 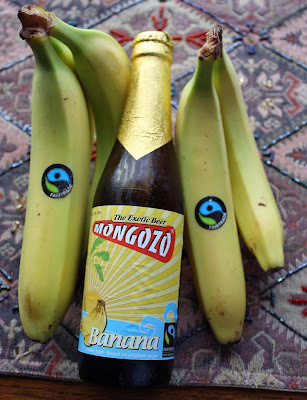 We had also purchased a bottle of Mongozo Banana beer, more for the novelty taste factor. It was actually quite good, and I'm not a beer girl at all. Next time i'll try the coconut beer. Butter a 9 by 13 inch tin. Melt the margarine and the honey in a pan then stir in the remaining ingredients. Spread the mixture into the tin and bake in the preheated oven for about 20 – 25 minutes or until firm and golden. Cool slightly before turning out on a board and cutting into slices. I have to say, you got me at banana beer...very unique...must see if I can find some. The flapjacks look good too. I love the idea of banana ones. PS: Glad you're feeling better. I used to get Banana Beer from Tesco, it is so gorgeous. I don't usually like beer but Banana beer is fab! Great idea to make flapjack to go with it. I love a flapjack! Banana beer sounds very interesting. This looks interesting...I wonder if I could use stevia rather than honey for the sweetener...and what are sultanas? Those look so good! Glad you're feeling better and thanks for stopping by! I want some of that banana beer now! Oh, and those flapjacks look nice too. I love stuff like that with coffee (Fairtrade coffee of course-smile). Anyway, I'm going to peruse around your blog a bit, Deary! Ive tried raspberry and chocolate beer but never heard of banana, how interesting. The banana flapjacks sound good, are they very sweet? p.s. I'm not a beer girl either but coconut beer sounds interesting to me! I love flapjacks and these sound delicious with the banana added. Just found your blog! Some of the recipes will come in handy (we grow plenty of, and absolutely love squash, so that Thai soup looks ideal). Might even treat the kids with the flapjacks this weekend. I am behind on my blog reading, I am so sorry you have been sick. I hope you and your hubby are starting to feel better! Your banana flapjacks look yummy. Heheh, I've been growing my own veg for several years now (and my folks have always grown their own veggies too), it's just taken me the best part of a decade to get around to having an allotment. Before that it was raised beds in my patch in Sheffield, now it's a fairly large garden in North Lincolnshire. I'm sorry to hear about your losing your allotment (alossment really), that's such a shame. But you can cram an lot into a small garden! I hope you're feeling better, Mango. It's no fun being sick, but at least you can commiserate with your hubby (misery loves company). Your recipe for Banana "Flapjacks" sounds yummy; I always thought flapjacks referred to pancakes. Did the beer have a banana flavor to it? My husband jus twhispered to me, that he wasn't really a big fan of the these flapjacks, but you try them out and make your own decision. It was the uniqueness of the flavour that tempted me to try it. Hopefully you should be able to get some on-line. Your right, I've actually saw some there. I liked the fact to that it wasn't overly beery! Thanks Katch. If you ever see banana beer, do give it a try. I've never used stevia, so really cannot advise. Sultanas are sun-dried green grapes, they are similar to raisins, but are lighter in colour and plumper. They are used a lot in Persian cooking. I wish I could give you some banana beer, but sorry its all gone! Thank you for sharing your own adventures of planting an organic garden for your mother. I am envious that she can walk outside and have almost a whole meal-almost...I dream of that one-day. For now small steps. You've got me interested: raspberry and chocolate beer, now those are flavours i've never tried. The banana flapjacks had a little sweetness, not overly as the banana flavour does come through. Thank you so much Mark for you kind comments. The soup really is delicious. Every day I feel a little better. I can't say the same for my hubby who is still coughing and spluttering! Thanks for letting me know. I just assumed you were new to the allotment (sorry). I've been told never to assume and I still mess up now and again. My husband likes flapjacks, but wasn't so keen on these. Have a go and see what you think! Thanks Barbara. I'm on the mend, but the husband still quite poorly. I remember Michelle of Veggie Num Nums saying the same thing to me about flapjacks referring to pancakes. Not in the U.K. Yes, the banan beer actually did have quite a strong banana flavor to it. Bananas and oats are one of my favorite combinations. 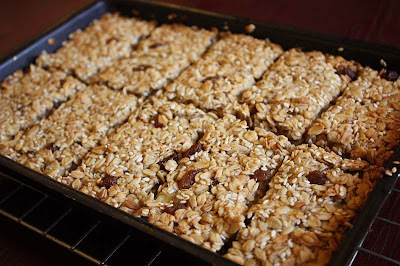 These flapjacks looks like gourmet cereal bars. Lovely! Glad you are on the mend - hope D follows you soon. Would never have thought of putting bananas in flapjacks - great idea. As for Stevia - it would work as a sweetener, but I wouldn't have thought it would give the same consistency. We grow our own, dry the leaves and grind them up, but I don't use it in baking. I use it instead of sugar in fruit dishes, tomato sauce and any savoury dish that requires a bit of sweetening. Thank you msmeanie. I would never had thought of calling them gourmet bars. Thank you Choclette, and Thank you for the information on Stevia. I am sure e and my readers will appreciate the insight, as much as I have. Its so interesting to learn that you grow your own and how you actually use it - its all new to me, so thank you for sharing. Thank you Sarah. The substitution of rice flakes sound good. Hope they turn out well. I am glad that you are feeling better now! You surely will with these tasty banana flapjacks!! Waw,...banana beer!! I have never tried that before! If you should come by some banana beer, please do try some. If you’ve tried one of my recipes, Please let me know by leaving a comment below or tagging me social media with @SeasonalShaheen. All text and photographs, unless otherwise noted, are protected by copyright. Please contact me for usage permission. I RECEIVE NO TRAFFIC FROM THEM. IF YOU FOLLOW, THEN PLEASE UNFOLLOW.